Someone gave me a box of this pizza crust, and I was so happy with how it turned out! The crust was crispy on the outside and chewy on the inside and the flavor was really good. I mixed it like the instructions said, and then spread it with a spatula on parchment paper. It’s sticky, but use a wet spatula to help spread it evenly, about 1/4 inch thick. Let it rise for about 40 minutes. Transfer the dough/parchment paper right onto the stone, and cook for 10 minutes. Add the toppings and cheese, and cook for another 10 minutes. The box makes 2 crusts. I baked them one at a time in the middle rack. I’m not sure how it would work to bake two at one time, but you’re welcome to try and give me feedback! Maybe if you switch them half way through? 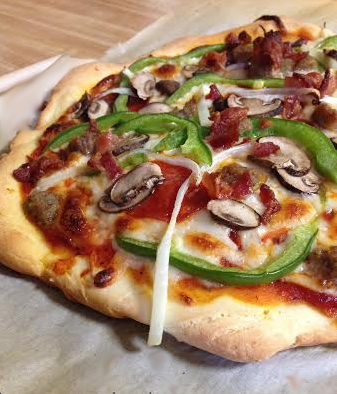 2 Responses to "Gluten Free Pantry Pizza"
Hi Sarah-we really like this one too! I saw a trick to help spread the “dough” out – spray cooking oil on one side of a piece of plastic wrap. Spread the wrap over the dough and smooth away! It works great with no mess!